Half Moon Bay was a sleepy campground. I got up around 7:00 and there was little happening. I checked out the small trailers around the loop. Since my friend Mitchell talked about getting one I’ve been intrigued by the concept. They are tiny by camping trailer standards and the ones in the campground were being pulled by Honda CRV’s and Subaru’s. Hmmmm. There was a fine mist in the air, so naturally all the tents were sopped. Ugh. 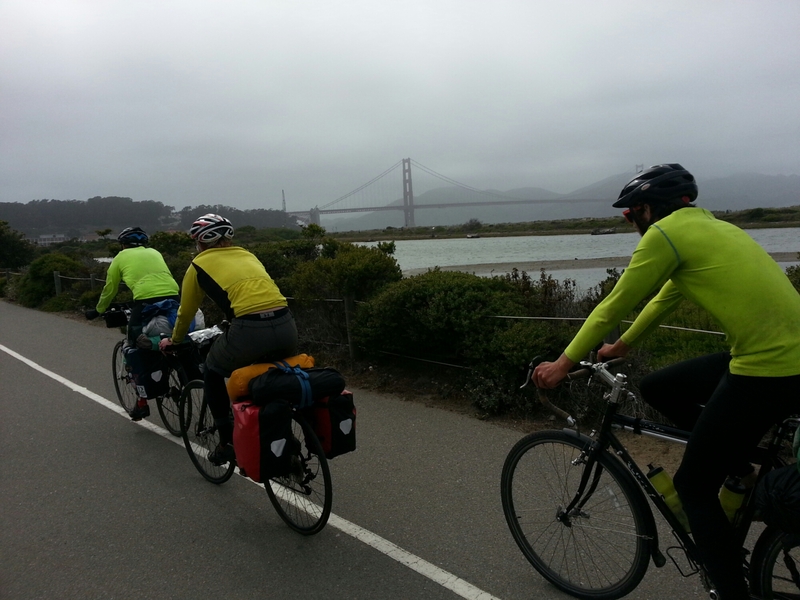 Since we were only 30 miles from San Francisco, we decided to pack up wet and ride 10 miles for breakfast. I put on five layers, seriously, as it was damp and chilly. I wasn’t looking forward to the big climb ahead in Daly City, the map profile showed it as about 600 feet and steep. Not again. The good news, slight tailwind. Even though it felt like we were riding in a cloud, the riding seemed fast and easy. We had a pretty good climb up to a tunnel, a tunnel unlike the previous ones, it was straight, well lit and had a ten foot wide bike lane. An amazing transformation took place in the tunnel from Montara to Pacifica. When we entered, it was overcast and child, when we exited, it was sunny and warm. Crazy. 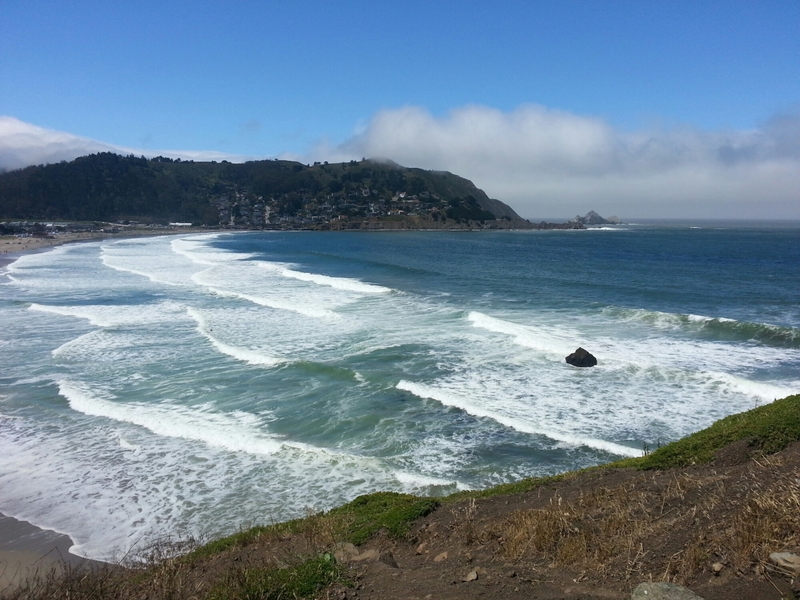 Thus was the view on the Pacifica side. Daly City was still ahead, and the climb stunk. It was urban and over 7%. At least I didn’t walk. 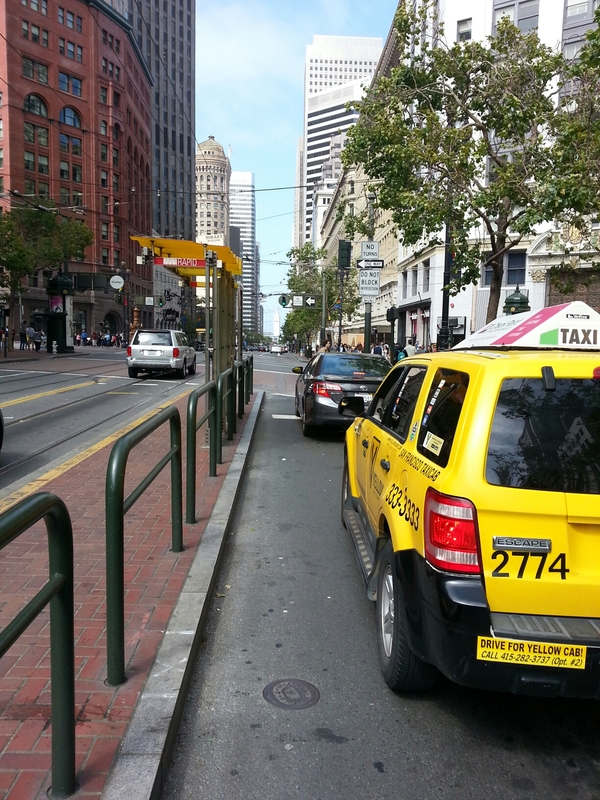 On the backside, it was an easy coast/ride to the edge of Golden Gate Park. 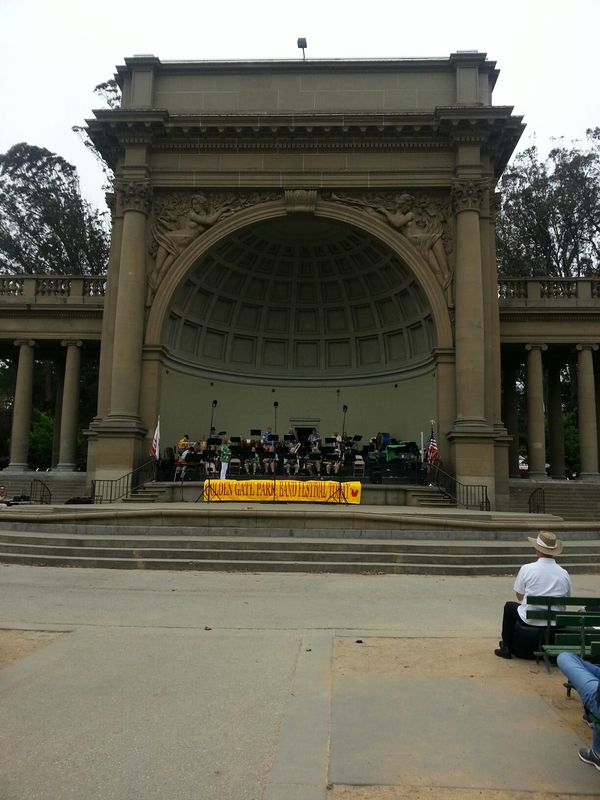 We tooled around the park and came across the 9th annual Golden Gate Band Festival. There was a big band playing and we watched for a while. They played the usual repertoire, In the Mood, What a Wonderful World (with a really bad Louis Armstrong impression). I’ll admit to nodding off a couple times. On the Bob list of things to eat in San Francisco was pizza. Google/Yelp led us to a place highly rated by Zagat. It was dark and surprisingly good. We ordered two large deep dish pizzas that were supposed to feed four each, I had three slices somebody had five. Another waiter impressed. Market Street goes along the piers where the tourists congregate to buy souvenirs and watch the seals. Dave joined the throngs, I guess that was on his San Francisco must do list. 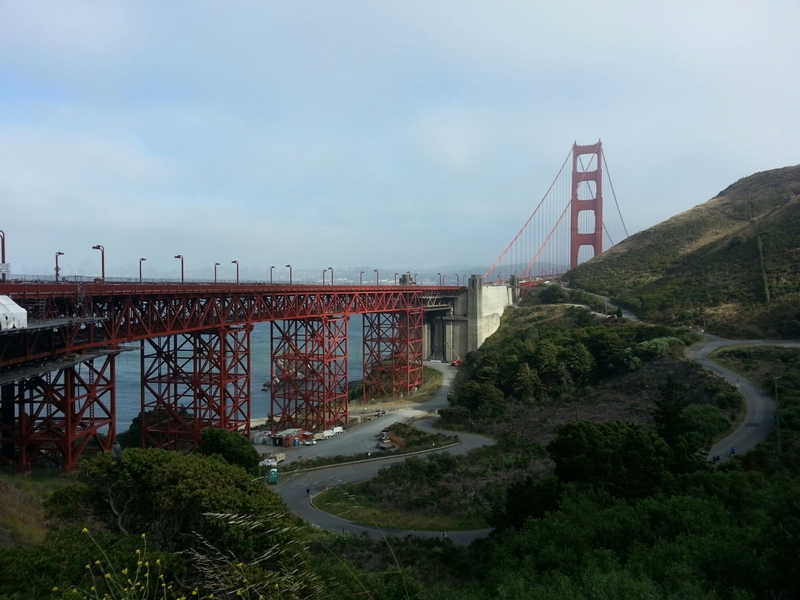 Further along, the Golden Gate Bridge came into view through the fog. Biking across the bridge was a highlight for me. If I did it right and can extract it from the GoPro, I might be able to share a video. The wind was hiding pretty good across the bridge and when we made a short right angle turn into our around one of the two vertical towers, it stopped you dead and almost blew you over. The video may have an expletive. The view back across the bridge. 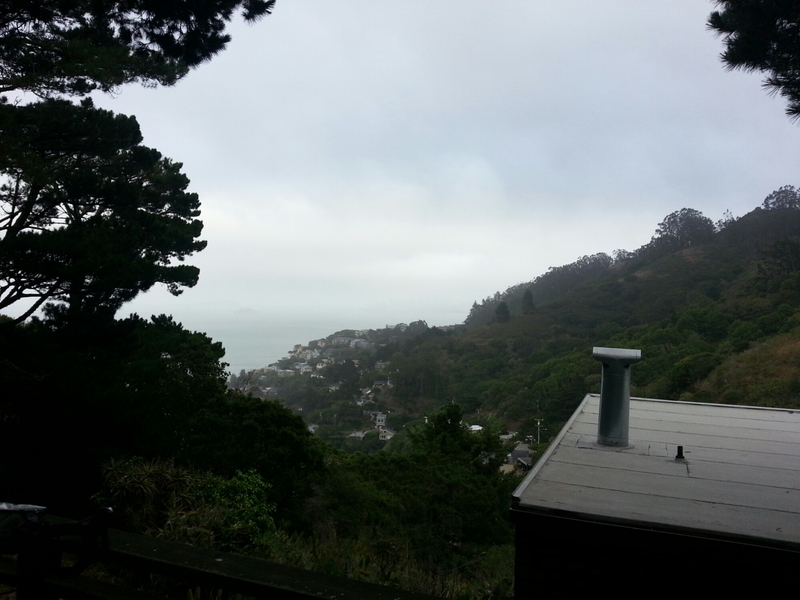 We are staying in Sausalito with friends of Dave’s family. That is the good news, the bad news is another 500 foot climb with 18% gradient. It was so steep, I got off, and could barely push Jane up the hill. Crap that was hard. They fed us like kings. We ate a ton even though the pizza was still settling in our stomachs. Tomorrow, Grant plans to ride us out of town, and not in the Old West style. It will be his first ride since he had a bad car incident. It will be out challenge to keep him safe. Bodega Bay is the target for tomorrow. OotD: Bike thiefs deserve a special place in Hell. Grant said they estimate 10,000 leave the city every week in containers headed for China.